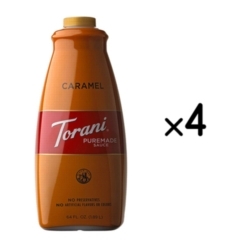 Torani's Caramel Sauce forms a rich and buttery layer of divine delight in the cup. Can be added to ice cream or dessert as well. Caramel can be salted for even more flavor. Comes as a case with four 64oz bottles. $0.30 / oz. $0.28 / oz. $0.27 / oz. $0.24 / oz.